Back in July 2010 musician of electronic music Remy Stroomer (aka REMY) recorded the first version of an ambient music piece. It became a trip of one hour which might be at some points in the line of the composer’s solo work, but it was decided that this project was about to be presented as an ambient sideproject. 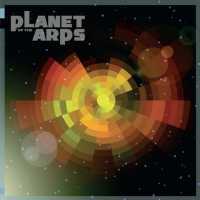 To be called “Planet of the Arps”. The name refers to the musical phenomenon arpeggio (whether or not produced by an arpeggiator), Halton Arp and his Atlas of Peculiar Galaxies, Alan R. Pearlman and his legendary ARP-synthesizers, and it might be clear that it also winks to the “Planet of the Apes” science fiction franchise. As soon as the first version of the music piece was recorded, Remy had in mind to involve a fellow musician to contribute to this project, as he felt it needed an extra touch before it eventually could be released. When the Ricochet Gathering event took place in Berlin, in October 2010, Remy asked Wolfram Spyra to be part of this ambient work. Although ‘Der Spyra’ wanted to work on it, there seemed to be lack of time, and above all both artists had other priorities at that moment. The project was set aside for the time being. When Remy was invited to perform at the Zeiss Planetarium in Bochum (Germany), September 15th 2012, he decided to perform this particular piece of music. Simply because it was about to fit perfectly on this location. Some additions and edits were made, and during this solo concert version 2.0 was established. Then, almost two years passed since then, when Remy organized a concert evening at the Ruins of Brederode in Santpoort- Zuid (Netherlands), June 27th, 2014. For the line-up Remy programmed his band at that time, Free Arts Lab, as well as Wolfram Spyra. The original piece, remixed and sublemented with elements from the live performances. Let’s see it as a project which needed this time to evolve, and to result into the version to be heard on this “Planet of the Arps”.